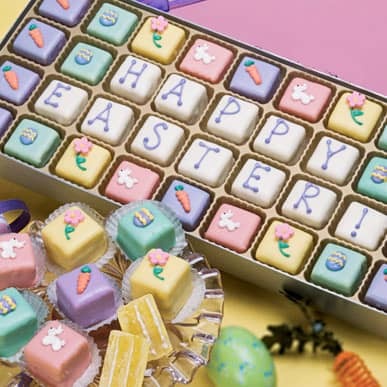 Bite-sized confections, neatly decorated with festive Easter decorations. Ideal for Easter gifts or as a centerpiece for Easter dessert. For your enjoyment we've created this delightful Easter assortment. Freshly milled almonds and rich sweet butter combine to created a perfect mini cake. These Bite-sized mini cakes are then filled with delicious fillings, and drenched in creamy colored chocolates. Our Easter Demitasse gift box includes 36 hand decorated petit fours. Our Easter flavors include: Raspberry Creme, Chocolate Truffle, Pineapple, Coconut, and Lime.